Prahlada, one of the greatest souls who proved that Bhakti is everything, told his father that life is pointless without 'Krishna Bhakti' - Some of you may say, 'Wait! Did he really say that?' - The surprise comes because, Krishna, who was the Hero of Mahabharata incarnated much after Sri Narasimha Avatara. Why did Prahlada even mention of Krishna Bhakti, even before Sri Krishna incarnated? 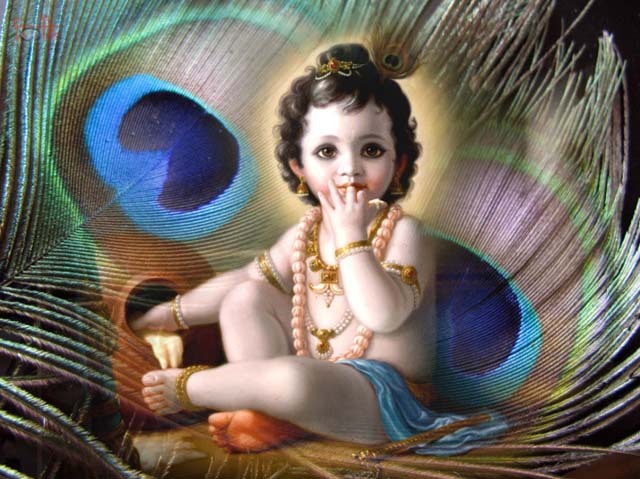 Who is Krishna? To understand the mystery of Krishna, one needs to introspect - What/who does He attract? Does He attract us all with His bewitching Form? Yes of course! But, He does much more than that! Vedas assert that all this creation which appears with Form is untrue. In an uncanny effort to grasp God, Her work is popularly split into three - Creation, Sustenance and Destruction. Each of the work is led by Brahma, Vishnu and Rudra (also called Shiva albeit incorrectly) who form the Holy Trinity. But God goes beyond this too: Two other aspects are - Obfuscation and Grace. Obfuscation is when a person is made to take this world 'seriously'. Everyone knows for sure that they'll all die one day, sooner or later. What is the point in working or in making money or in building relations or ANYTHING at all? Why don't people just lie down and die? So, to make this drama of creation run smoothly, She makes us believe that there are things that are important, things to be 'achieved' etc. People chase these illusory goals till they die. She achieves this by two ways - Avaranam (hiding things, say behind a screen) - In this case, the reality is 'hidden'. Or, by 'Vikshepam' when things appear differently that what they actually are. (what appears as a snake is actually a rope) - This is the key for creation to run smoothly. For a soul which has experienced this drama countless times, suddenly realizes that something is 'fishy' around them. They can feel the pain everywhere, they no longer enjoy the mundane. This is not 'depressed' state, but a state of dispassion or vairagya. When the pain becomes too unbearable, they cry for help not knowing what to do. At this time of extreme pain, Grace (anugraha) descends, comforts the soul, and merges it into divinity. She is the One who Pulls the mind out - She is the one who Showers Grace and pulls the soul towards Her. It is all the same power, in different directions. You might wonder, where did Krishna go as we are discussing the Glory of Sri Lalita Maha Tripura Sundari. When the mind is hell-bent on going outwards, there is a need of a Force, which is One with the Supreme Force, to take it inwards. This Force pulls the outward going mind 'Inwards' - Please remember that the mind, driven by senses is UNCONTROLLABLE. Scriptures says taming thunderstorms is easier in comparison. Due to infinite Kindness, God's Grace descends and decides to pull back the mind inwards. This force, attracts the outgoing mind inwards is indeed Sri Krishna. He first appears like an object of desire 'outwards'. But He is the Supreme Soul, the Paramatman. Though he appears external, and He attracts us, and when the devotee runs towards this Krishna, He is actually going inwards. It will be too late when the devotee realizes that! I bow to that Infinite Grace, That which cannot be described, explained, because of His infinite Mercy, took a Glorious Form and appeared before the mortals, to trick us all to be taken back to the Him, the Supreme Self. He first attracts with His Physical Form, in the form of a baby, kid, king, friend etc. Then He increases the devotees' desire for Him so much that everything else loses taste. Finally, the devotee has no other option but to merge in Him. The true Krishna Janmashatami for each of the devotees is when He decides to be Born in our lives, and pulls back our crazy Self 'inward' to merge with Him. Till then, we can keep going towards Him outwards, and it is His promise that He'll take us all Inward. Happy Krishna Janmashtami to All! May Krishna be born in all our lives! EDIT: I found a quote of Sri Ramana Maharshi that is scarily close to what I have written :-) If you replace Guru with Krishna, it is this blog entry. :-) - I always wondered if I had let my imagination run wild when I did this blog, I am happy it is in conformance with the Scriptures! "The Guru is both `external' and `internal'. From the `exterior' he [she] gives a push to the mind to turn inward; from the `interior' He pulls the mind towards the Self and helps in the quieting of the mind. That is guru kripa. There is no difference between God, Guru and the Self."